In a comic-book universe crowded with superheroes, Ant Man was a standout. While all the other characters were going bigger, faster, and stronger, Ant Man’s superpower was being small. Being small, it turns out, let him do things that no other crime fighter could accomplish. Lattice Semiconductor just unveiled the world’s smallest FPGA. In a design domain where bigger and faster rule the day, where bragging rights in the programmable logic paradigm hinge on having the most pins, the biggest package, and the fastest SerDes, Lattice apparently took a page from the Marvel Comics playbook and went all Ant Man on us. The iCE40 LP384 FPGA (Really, Lattice? We’d have an easier time remembering a name like “Ant Man”). Anyway, the iCE40 LP384 is 2mmX2mm. That’s right – not even a typo. Don’t sneeze at your lab bench, or you’ll never find it again. It’ll be down between two naps on the carpet and get picked up by Roomba on his next pass. Nobody will even notice it in the dustbin. But, that’ll be OK because one of these little gems costs just pennies. You can sprinkle them around your design like those multi-colored jimmies that go on ice cream desserts. Lattice categorizes these devices as “ultra-low density”, which might seem like a turnoff, but you can accomplish a lot with a little. 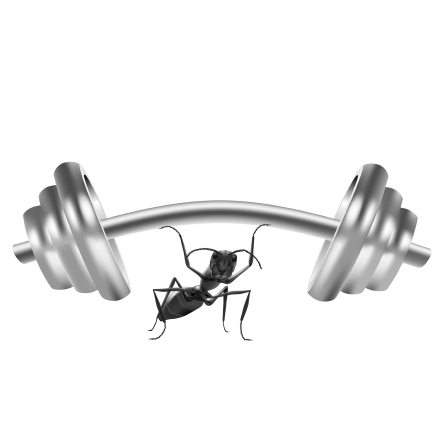 Our little Ant-chip costs as little as 50 cents per unit (if you order a whole bunch of ‘em. How many is a “whole bunch”? Think of a seven-digit number.) It has a capacity of 384 LUTs, and it consumes 25 microwatts static core power. The LUT fabric can operate at up to 100MHz. If you’re designing battery-powered portable devices like smartphones, tablets, medical monitors, digital cameras, e-readers, or other compact embedded systems, iCE40 would be the ideal “fix all” for tasks like pulse-width modulation, sensor management, or data transmission/aggregation. In these types of embedded systems, design teams are on an incredibly tight budget for size, power, and cost. No other FPGA ever invented fits the application profile of iCE40. In fact, your alternatives are more likely to be tiny MCUs or specialized ASSPs (if you can find one to fit your function). The good thing about the FPGA is that it always fits your function. For applications where the MCU doesn’t have the performance, the FPGA can do it in hardware. For applications where there is no ASSP available, you can make your own with the FPGA. It’s the duct-tape of the mobile electronics world. The iCE40 LP384 is just the newest and smallest member of the larger iCE40 family. iCE40 is unique in the FPGA market – taking advantage of a special type of non-volatile memory that allows the configuration to be loaded completely from the device, so that additional configuration circuitry is not required. It functions essentially as a non-volatile FPGA. Larger members of the iCE40 family include additional features such as embedded RAM and PLLs (as you’d expect to find in larger FPGAs), and they have densities ranging up to a whopping 7,680 LUTs with 128K bits embedded RAM, and 2 PLLs. What? You don’t think that’s so “whopping?” Consider that those LUTs are packed into a device that will fit in a 5mmX5mm package while consuming 360 microamps typical core current at 1.2V. Ahem. That’s how they do things in Ant Man’s family. Since then, Lattice has been continuing what SiliconBlue started – building ultra-small, ultra-cheap, ultra-low-power FPGAs for the mobile market. Obviously, they have to sell a crazy number of these little guys to make a profit – and they are. Lattice says they have now sold over a billion low-power, low-density devices – and the counter just keeps ripping. Given the types of sockets they’re winning with these devices, you may be carrying one around right now and not even know it. What programmability accomplishes in this arena is the possibility of differentiation. Of course, you can plug off-the-shelf components together on a PCB and create a mobile device that’s just like everybody else’s. That’s not very exciting. You can try to differentiate with software, but given the software platforms and the universe of apps available today, that’s also tricky. To make your device really stand out from the crowd, some hardware magic is almost always required. Designing in an FPGA will often let you add that tiny additional “something” that the other guys can’t do. It’s a blank slate for secret weapons. end right about there. The role of these tiny devices is in many ways more similar to what we used to do with CPLDs, but CPLDs never came close to the capabilities, form factors, and other accomplishments of these little guys – and the domain of potential applications is much larger as a result. Ant Man would be proud! Lattice is running basically uncontested in this race, and, if they execute well, it could be a very lucrative business for them. Lattice just released the world’s smallest FPGA. Can you see applications for devices like this?